A resistor is an electrical device which has a property to oppose the flow of electric current through it. Most of the time resistor is used in electrical and electronic circuits to limit the current. It is widely used element in electrical and electronic circuit. How does a resistor work? In a closed circuit, when electrons move through a resistor, the drift velocity of electron decreases. Here we will discuss exactly what happens inside resistor which causes slow down to speed of electrons. Electrons travelling through a resistor will collide with atoms of the resistor which causes their average velocity to decrease. Suppose we connect a resistor in circuit. 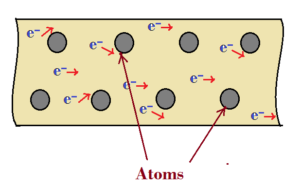 When the electron passes through it, the average speed of electrons is reduced and loss energy. When the electrons move through resistor, they collide with the atoms of the resistor and this affect the speed of electrons. Each collisions took some energy out of electrons. 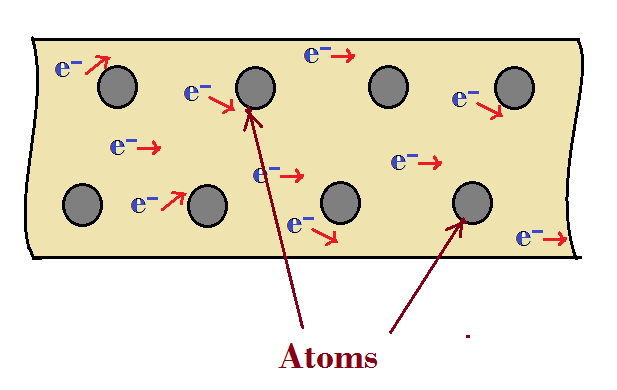 Under normal condition, the atoms are almost stationery and electrons collide continuously with the atoms of resistor. Hence it act as barrier to the flow of electron. Therefore average speed of electron is reduced and electron also loss energy. Beside this, if you recall the theory of molecules energy level and forbidden energy gap of molecules. It says electrons require energy to jump from valance band to conduction band. This energy is different for different materials depends upon how tightly electron bound to the nucleus of atom. In resistive of material, forbidden energy gap is small has it require more energy to jump electrons. Therefore, easier it for electrons of a molecules to jump from valance band to conduction band, less will be the resistance of material. 1. Linear resistors are those which obey the ohm law i.e. current through it is directly proportional to applied voltage. – Fixed resistors the resistors whose value cannot be changed. – Variable resistors are those whose value can be changed. 2. Non linear resistors are the resistors, in which current does not changes linearly with change in applied voltage i.e. these resistors do not obey the ohm law. A capacitor is a passive element that store electric charge. A capacitor is a device that store electric charge in the form of electric field. 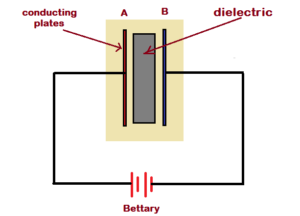 In this article we will learn exactly how does a capacitor store electric charge electric energy. Capacitor consists of two plates of conducting materials separated by an insulating material like paper, mica, air etc. This insulating material is known as “dielectric”. Depending on the types and size of dielectric, the type of capacitor and application of capacitor is decided. For example, high frequency capacitor and high voltage capacitor have difference in their dielectric material. When the capacitor is connected across a battery, one plate (plate A) of capacitor is connected with positive terminal of battery and other plate (plate B) of capacitor is connected with negative terminal of battery. This start charging of the capacitor. 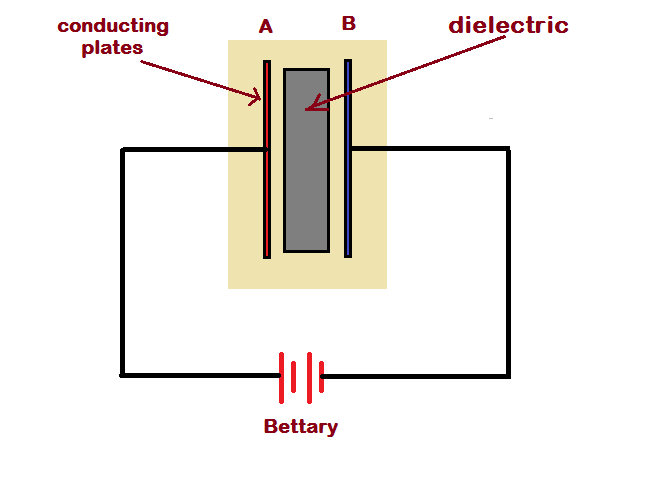 The plate B accepts electron from the battery. Hence it becomes negatively charged. The plate A losses electrons to the battery hence it becomes positively charged. This process create a potential difference between two plates. When the capacitor is fully charged it has the same voltage as battery. The insulating material between these two plates avoid electrons to move from one plate to another and keeps plates separate. Therefore a capacitor stores energy in its dielectric. When the capacitor is disconnected from the battery, the charge will remain store in the capacitor. In simple words, there is a potential difference between two plates of capacitor. To discharge the capacitor it has to connect with external circuit or wire. The two charges would like to reutine with one another what cannot. Therefore, there is an electric potential energy associated with interacting charges and this is the stored energy in its electric field. An inductor is a passive device which store energy in the form of magnetic field. How does an inductor stores energy? Before understanding the working of inductor you must have clear picture of how inductor is made or manufactured. Inductors are simple in construction. It is just a coil of conducting wires. The conducting wire is generally made of copper. This conducting wire is wound around a core at its centre. This core might be iron, metal, glass non-metal and even air. To understand the working of inductors you have to learn how does an inducted stores energy? How does inductor stores energy? When the current start flowing through coil, the coil has tendency to build up a magnetic field. During this process of building magnetic field, the coils opposes the flow of electrons through it i.e. opposition to current. To overcome this opposition, the electrons have to release or utilised some of its extra energy which is stored in the form of magnetic field. Therefore, to build the magnetic field, an inductor takes the kinetic energy of moving electrons and store it in the form of magnetic field.